You are currently browsing the archives for the E-supply Chain category. Happy Thanksgiving Weekend 2018 from SafeSourcing. Who were the Pilgrims? Todays post is by Ronald D. Southard, CEO at SafeSourcing Inc. According to the Mayflower Society, as history has evolved, any of the 102 Mayflower passengers who arrived in Plymouth on the Mayflower and survived the initial hardships is now considered a Pilgrim with no distinction being made on the basis of their original purposes for making the voyage. 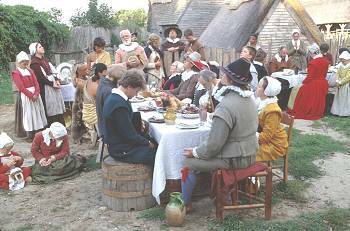 The Mayflower Pilgrims and their fellow travelers were authors of the first true governing document created in a New World colony. The Mayflower Compact is considered to have set the stage for the Constitution of the United States. These were the same pilgrims that were responsible for the holiday we celebrate today called Thanksgiving. We wish you and yours a peaceful and happy extended holiday weekend. I recently attended a local ISM meeting where the guest speakers from VAP Packaging did a terrific job (with a number of their team members) explaining the importance of culture not only within their organization but for other organizations as well. The culture they have developed has empowered their entire team with the confidence to think outside the box and a system or rewards when they do so effectively. It was impressive. For a long time, the culture of a company and how that company handles its supply chain have not always been on the same page. Unity and Teamwork are preached to operations while procurement is still told to SAVE MONEY and CUT COSTS. Opportunity not just Order Taking – As procurement professionals we are tasked with assisting the business to run more smoothly, to help save money and to help foster business partnerships that will grow the company. In many companies this translates to “Rick, I need a million widgets. Go get me some quotes and samples of the best ones out there. After we decide what we want you can beat them up on price and write up the contract.” While this does provide some value to the organization by freeing operations time to do what it needs to do, it does not account for the fact that maybe “Rick” could have presented 2 new options to the business that switch to “dongles” at half the cost, half the volume and can improve operational efficiency by 25%. Not all companies will embrace outside the box thinking from its procurement team so understanding where the current culture stands is an important part of improving that. Value of cost reduction – There are so many times people get enamored by the numbers. They hear about a solution or product that has an ROI of 5x in 6 months or that can generate $500,000 in savings, and they instantly seek for ways to implement that service or bring that product into use. What can be ignored in the process, is the fact that by introducing this new product that is going to save $500k to operations, internal procedures and personnel must now change what they are doing, resulting in a drop in efficiency of 40%, costing the company $1M over 9 months. There can be a cost of change to achieve savings and understanding the pressure points with the organization is critical to weighing the value of a new change. Understand the Relationships – Many professionals will see this point and think “See, don’t mess around with the vendor relationships I have spent years developing.” This is not saying that. The point being made here is to understand completely what relationships are currently in place so that they can be reviewed for improvement. Partnerships can be good. They can provide security and assistance in emergencies and they can help strengthen companies when the fit is right. Partnerships are not always good when they are defined by “I have been doing business with Jim for 10 years and he has never let me down. I am sure he is giving me the best prices he can give me. He even stops by once a month to take me to lunch where I hardly see other vendors.” These types of relationships have the tendency to cover years of price increases and terms that have benefitted only the vendor. Understand the relationships in place so that facts and research can be done to either challenge or support the value they bring to the organization. At SafeSourcing we understand the value of understanding your company culture and have been doing it for our customers to help them effectively structure projects for years. For more information on how SafeSourcing can assist you or on our “Risk Free” trial program, please contact a SafeSourcing Customer Service Representative. We have an entire customer services team waiting to assist you today. The Importance of Supplier Communities! Suppliers offer a great value to sourcing events. Typically you can use the suppliers’ knowledge on their industry. Without having a knowledgeable supplier base, your sourcing events will not be successful. By leveraging a Request for Proposal, a company can ask the vendors the best plan for their needs, thereby receiving a broad range of solutions to the problem. Much like technology, the supplier communities are constantly evolving, and typically if you run an RFQ in 2012, there will be major industry changes by 2015. When you leverage the supplier community, you can find the best way to run an RFQ to match the industry. When you match the quoting process to the industry standard, you will receive apples to apples quotes. SafeSourcing can help leverage the supplier community within any industry. For more information on how we can help you with your procurement needs or on our “Risk Free” trial program, please contact a SafeSourcing Customer Service Representative. We have an entire customer services team waiting to assist you today. Are you doing business with your suppliers “A” Players? Today’s post is our SafeSourcing. archives! You can classify all employees in an organization into three categories: A, B, and C players. Should an organization strive for 90% of employees being ‘A’ players? No, a healthy distribution of A and B players is what an organization should strive for. C Players– All employees generally start as C players due to their training and inability to bring a benefit to the company right off the bat. Genuine A and B players will not be C players long. They will eventually bring value to the company and move to an A or B player. The employees that remain C players will eventually be weeded out of the company. B Players– B players can perform the tasks given to them well, but show no initiative to perform beyond average. B players show more loyalty to a company. In many cases B players are former A players, but do not want the responsibility anymore for whatever reason (age, personal, family, etc.). B players will complete the task given to them and with their loyalty will save companies money in hiring and training. A Players– Everyone wants a company full of A players. A players are responsible and work to bring great benefit to the company. Sure they are experienced, motivated, and bring great benefits to your company, but how long will they stay satisfied? With the knowledge, motivation, and experience A players have it can be challenging for organizations to sustain their employment. A players find greater opportunities and their loyalty is far less than B players. What type of player is your company searching for? You cannot run a company with only one type of player. A successful organization will have a healthy balance of A and B players. Understanding who your A and B players are is an important key step. We all work with the three different players from our suppliers and we know it can be challenging to receive the results or information you have requested from a B or C player. If a company you are working with has not established who their A, B, and C players are, then you could end up working with any of them for contract negotiations. At SafeSourcing we have an extensive SafeSourceIt™ Supplier database and existing relationships with the suppliers that will deliver the results you request. SafeSourcing finds the suppliers A players in order to bring value to your company from the outside. ​In my last blog Three myths about Firewood Part I , I explained that there are 3 myths about firewood. The first myth I cracked was that you should keep your firewood close to your home. That was incorrect because your home could become a home for termites and other bugs. With this blog I will cover the other two myths about your firewood. The remaining two myths are: 1. Bring a lot of wood inside now so you don’t have to go back outside and 2. Spray pesticides on the wood to kill pests. ​Bring a lot of wood in so you don’t have to go back outside to get more. This myth should be easy to crack based on our first myth. Obviously, you want to bring in as much wood as you can to avoid that nasty winter weather. Sounds great, however, once that wood gets indoors, any pests that may have been frozen or hiding could wake up and begin to find a new home in YOUR home. If you bring in too much firewood you could expose your home to an abundance of spiders, termites, roaches, and other nasty pests. Safe to say, we should just keep our wood outside until we need it. ​The next myth of spraying pesticides on the wood to kill pests is actually a very common mistake. The idea and desire is to kill all pests on the wood so they cannot infiltrate your home. However, spraying pesticides on your firewood will create worse problems. Most pests that can chew through wood are pretty resilient. By spraying the wood you will only cause carpenter pests such as carpenter ants and termites to simply borrow deep into the wood to protect themselves. Once you burn the spray and infested wood, you are releasing all those chemicals into your home.So, there is obviously more to firewood than meets the eye. Avoid any pitfalls and keep your home pest-free this winter by recalling these cracked myths. Also, if you are a company looking to purchase bulk firewood then give SafeSourcing a call. We can help you with all your firewood sourcing needs. “Firewood and Pests: 3 Myths | Plunkett’s Pest Control.” Plunkett’s. N.p., 02 Mar. 2016. Web. 17 July 2017. What’s the genesis of your supplier database and how was it built? Todays post is from Ronald D. Southard, CEO at SafeSourcing Inc.
All databases have their start as an information gathering exercise that ultimately is enhanced by those characteristics the owner or developer determines to be useful to the community of interest the database is to be offered to. The information then becomes part of a data model where information sets can be accessed or searched based on a variety of queries or questions. Most developers follow a process called Universal Description, Discovery, and Integration or UDDI as this process. Universal Description, Discovery and Integration or (UDDI) is a standard established for building online databases of companies and the goods and services they provide, similar to Yellow Pages for the Internet. UDDI is intended to help businesses locate suppliers and products. Sourcing companies supplier databases go well beyond this definition. Data models can be extremely complex and that is where they become more than a simple on line yellow pages. In fact high quality supplier databases should be able to provide much of the data you might find in the opening pages of a detailed RFI. A simple query like show me all companies within a 500 mile radius of your home office zip code that provide a set of products that meet the following safety certifications. A next step might be summarizing all company information for these companies by a list of attributes such as company description, sale, years in business, officers etc. How easy would that make your life? Today’s post is by Gayl Southard, Administrative Consultant, SafeSourcing. Running into the local Kroger or Safeway for a quart of milk and coming out with a cartload of unintended food purchases is universal—and it’s not our fault. Supermarkets make us do it, or at least they try. Grocery shopping is an orchestrated process. Every feature of the store—from floor plan and shelf layout to lighting, music, and ladies in aprons offering free sausages on sticks—is designed to lure us in, and seduce us into spending money. Once you enter a grocery store, it’s often not easy to get out again. A common feature of supermarkets is the one-way entry door; to get back out, you’re compelled to walk through a good portion of the store. After the one-way front door, the feature first displayed is the produce department. The impact of all those scents, textures, and colors (think fat tomatoes, glossy eggplants, luscious strawberries) makes us feel both upbeat and hungry. Also the store bakery is usually near the entrance, with its smell of fresh-baked bread; as is the flower shop, with its buckets of tulips, and bouquets gorgeous flowers. The message we get right off the bat is that the store is a welcoming place. The supermarket is designed to make customers spend as much time as possible in the store. Dairy departments are almost always located as far from the entrance as possible. Customers will most likely have at least one dairy item on their list which will make them walk the length of the store. Mid-aisle positioning is intended to sideline the so-called Boomerang Effect, in which some shoppers (notably men) simply head for the item they need, then return the way they came. “Music encourages us to dawdle: A famous study of background music and supermarket shoppers, conducted in 1982, found that people spent 34 percent more time shopping, with a corresponding uptick in sales, in stores that played music. And supermarkets tend to be devoid of external time cues: most have no windows or skylights, and shoppers are often hard-pressed to find a clock. Shelf order is a psychological trap. The expensive items are generally placed at eye level; generic brands are on the lower shelves so that you have to crouch. Foods meant to appeal to kids are set at kids’ eye level so that the cartoon characters on the boxes make eye contact with (short) passers-by. The displays at the ends of the aisles (end caps) are shopper traps. Companies pay high prices to display their products there. A product at an end cap sells eight times faster than the same product shelved elsewhere on the aisle. Also the size of our shopping carts increases the chance of our buying more. Carts have tripled in size, and they’re still growing. Shoppers tend to buy 40 percent more with a bigger cart. So what to do about all this? Make a list and stick to it. Try not to shop so often—fewer and more efficient trips to the store are easier on the pocketbook. For more information on SafeSourcing and how we can help you with your sourcing needs, or on our Risk Free trial program, please contact a SafeSourcing Customer Service representative. We have an entire team ready to assist you today.